Earlier this week we went out for Wings Night at one of our favorite restaurants. While we were waiting on our wings, a little boy, around 8 or 9 years old, came in trying to sell his last 2 bags of sweet red peppers for ¢1000 colones ($1.65 USD) per kilo. Of course I had to help him out, and I bought a kilo bag from him. Yesterday we smoked and roasted the pepper and they are amazing. Wash the pepper and split them in half. Smoke them in the smoker for 90 minutes, turning at the half way point. Remove the peppers from the smoker and place them on a cookie cooling rack in a baking sheet. Roast the peppers in the over at 400°F until the skins are charred and blackened. It will take about 40 minutes, and you should turn them over from time to time so they blacken evenly. When the peppers are mostly blackened, place them in a large bowl with a tight fitting lid, or a paper grocery bag and roll up the bag to seal in the steam. Let the peppers steam in their juices for about 30 and the skins will soften for peeling. When the peppers are cool enough to handle, remove the skins, stems and seeds, and place them back in the bowl. Don't rinse the peppers in water, but try to remove as many seeds as you can. Save the juice in the bottom of the bowl. Pour the vinegar in a shallow baking dish. Dredge each pepper in the vinegar to thoroughly coat each one and place them in another bowl. Sprinkle the bowl of peppers with the salt, and very gently mix the peppers with the salt. Pour about a ¼ inch of vinegar into the bottom of the jar. 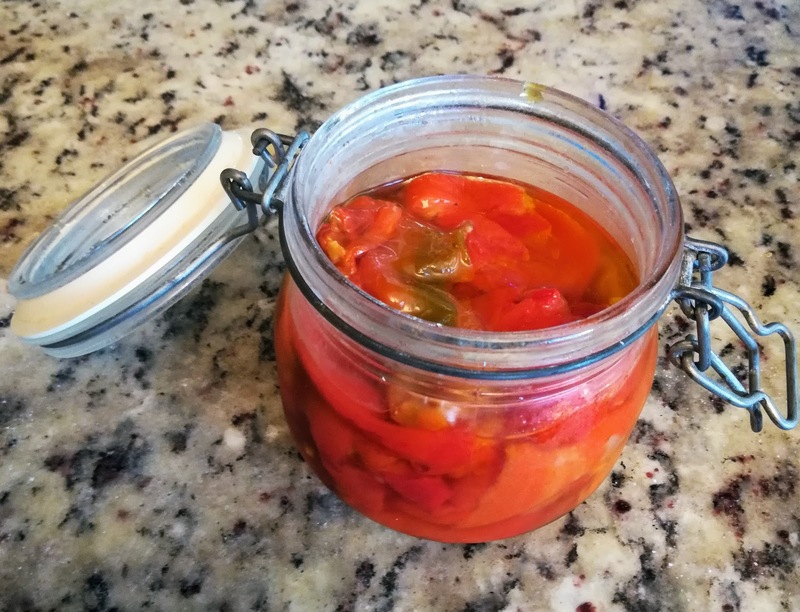 Pack in the pepper, leaving at least and inch or two at the top of the jar. Use a butter knife to run down the side of the jar to release any air bubbles. Pour in the leftover pepper juice. Pour about a ¼ inch of oil on top of the peppers, and screw the lids on. 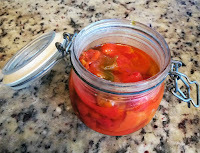 These peppers will keep at least a year in the refrigerator without traditional canning methods, like a water bath, etc. But, as good as these are, they'll be gone in no time. Use them in pimiento cheese spread, sandwiches, roasted pepper dips, meatloaf, soups, salads, etc.